(Beverly, MA) What is it about the simple black-and-white getup of the nun’s habit that makes its inhabitant seem so powerful? The nun has become a fixture in theatre and film because the costume demands attention. From the beginning, actress Colleen Moore captivates in this rambling, jovial one-woman play as the Sister, a “cool nun” who can crack a joke at your utter fear of the habit. With poised delivery, Moore breezily chats with the crowd about life, the universe, and everything. Sister raps about the Nativity, and invites audience participation to play the parts of Mary, Joseph, and the others. Christmas kitsch abounds, and baby Jesus is a plastic doll with a light inside that blinks. 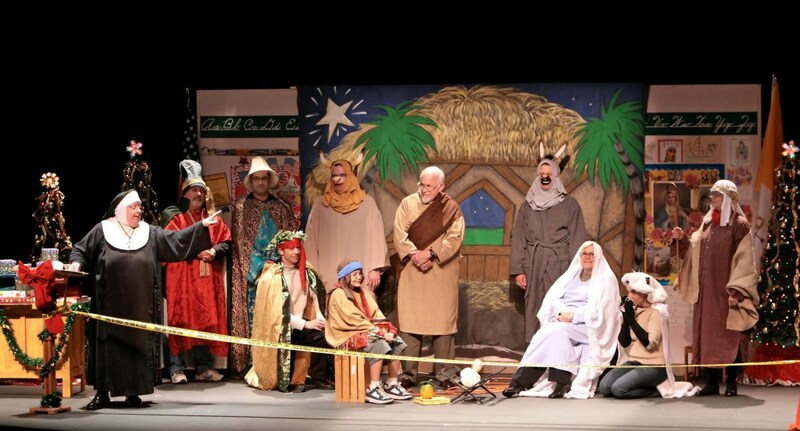 Costumes for those called up on stage to play Wise Men and shepherds consist of little more than shirts and bathmats. Everything is ridiculous, yet strangely solemn, and the show invokes a flashback to nighttime religious school, even for people who have never spent time in such classrooms. This isn’t high art, but it would take a miracle not to laugh at this show, which is part of the Late Nite Catechism series. If you missed this holly, jolly show, there are others in the series to catch. This entry was posted in Uncategorized and tagged 2014, Beverly, Christmas kitsch, Colleen Moore, Craig Idlebrook, December, Late Nite Catechism, MA, Marc Silvia, Maripat Donovan, Nativity, nun, Spectacle Management, Vicki Quade by craigidlebrook. Bookmark the permalink.